Thank You Jorn Harald Paulsen , please share me more updates in specially in rigging only. Great rig you have here. Does anyone still have the obj for download? I’d love to give it a try tbh…. This is an amazing Rig! I just recently decided to focus on rigging and this is some really inspiring stuff! I can’t wait to see the breakdown! The way the toes move and all the small gears and pipes is what did it in for me. C: This was put together very nicely and it shows all the effort put into it. Nice presentation! Hi, this rig looks really awesome. I’m very interested in what you’ve done with the tail. It looks sort of like an interactive simulation. I’d love to hear about how you set that up. Also, I’m curious, did you do anything to automate the metal plates on the tail and spine? Congratulations on the great work! The tail has a hair-curve which is driving a joint-chain through the ikSplineHandle, the input curve is skinned to the rig-joints so that you can adjust the dynamics relative to the original animation. Very cool. Thanks for the tut. Seeing your rig move so beautifully makes me want to go back and redo mine! Also, I just noticed. 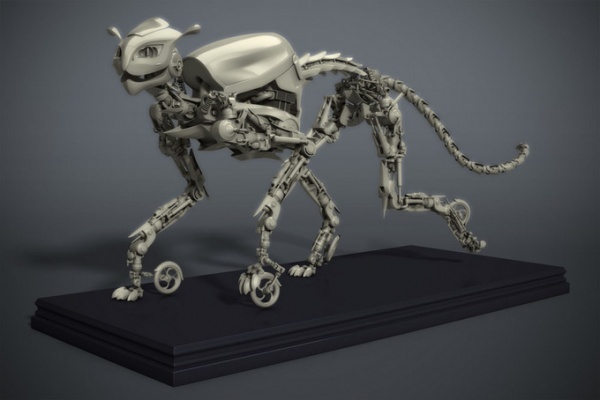 You removed the wheels that were originally attached to the cat’s feet. What prompted you to do that? Just curious. Hahah, now when you say it, that would indeed be hilarious 😀 Give me a peep when you get it finished, it would be interesting to see some different approaches on the legs. i just saw your mechanical rigging reel “Mechcat”. I really inspired by you by this reel. Can you please just tell me about good tutorials on Mechanical rig and dynamics reel ? I’m sorry to say that I don’t have any tutorials to recommend, I searched around for mechanical tutorials myself when I was working with this one, without any luck 🙁 There might be some good mech tutorials out there, but I couldn’t find anything, other than tutorials covering basic stuff. WOW this rig is amazing! is it for Maya perhaps? I’d love to animate it sometime! do you have a .MB or .MA rigged version? The Art of Rigging books from CG Toolkit are a really good resource for mechanical rigging. The URL is http://www.cgtoolkit.com/ but their website seems messed up right now, but maybe you can find where to buy them somewhere else.